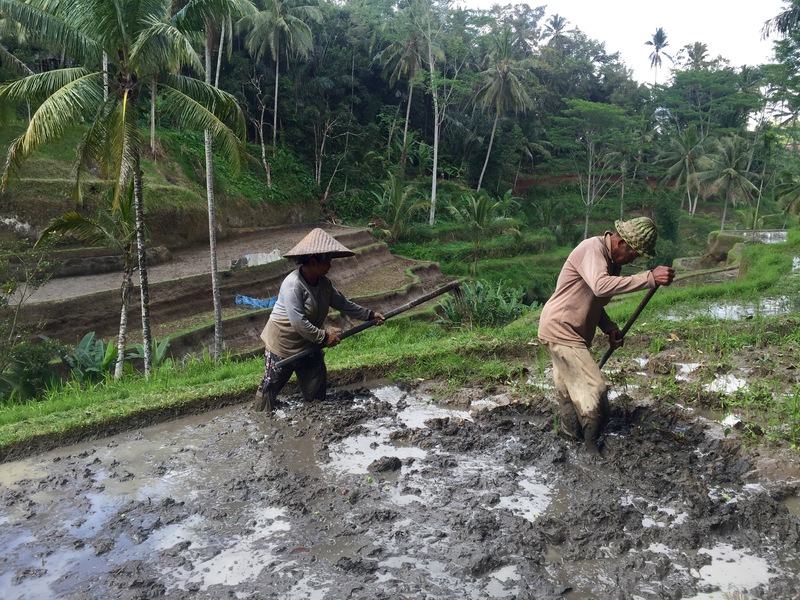 During high season, tourists swarm to the Tegelalang Rice Terraces every day (that the weather allows). 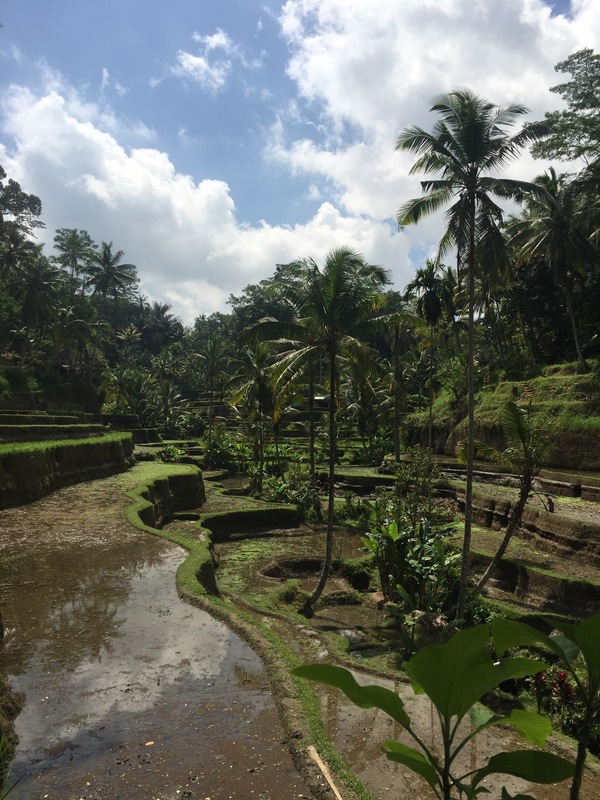 Lucky for us, the weather was beautiful that Wednesday morning, so we left to see the terraces right after breakfast. We got on our motor bikes and made it there by about 10:30PM. By that time, there were a handful of tourists already at the entrance taking photos. The boys and I hopped down a few slopes to find the perfect empty spot to take our photos at. 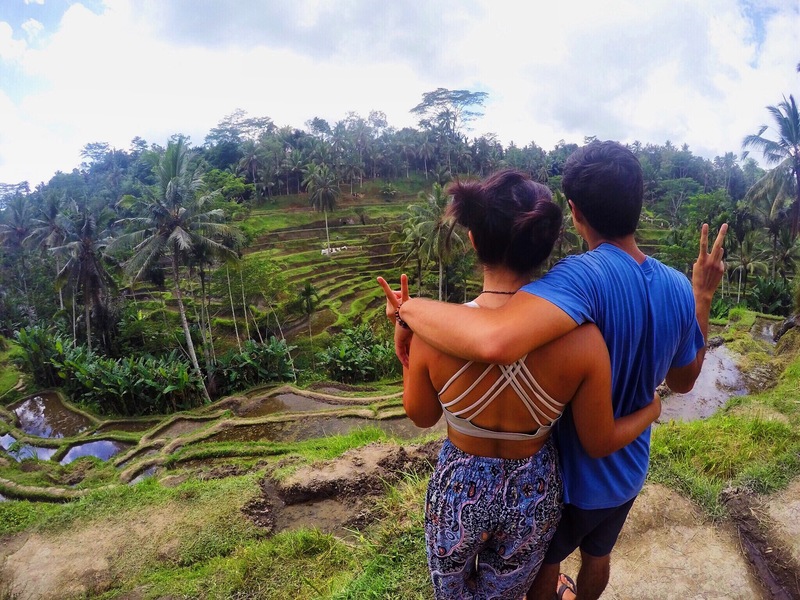 On the other far side of the rice terrace were more tourists walking through it. 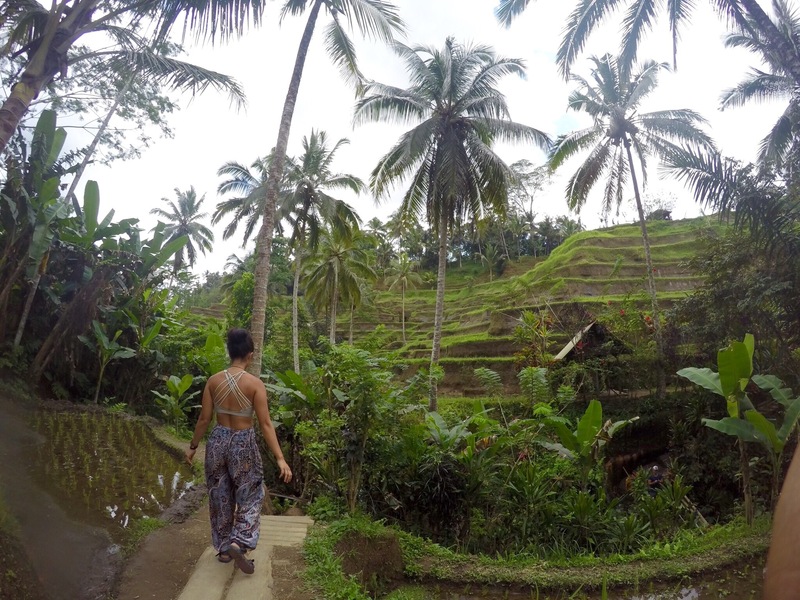 Feeling tired and sore from yoga the day before, I almost didn’t feel like trekking through the rice terrace. The boys started jumping down the slopes and I had no choice but to follow them down. 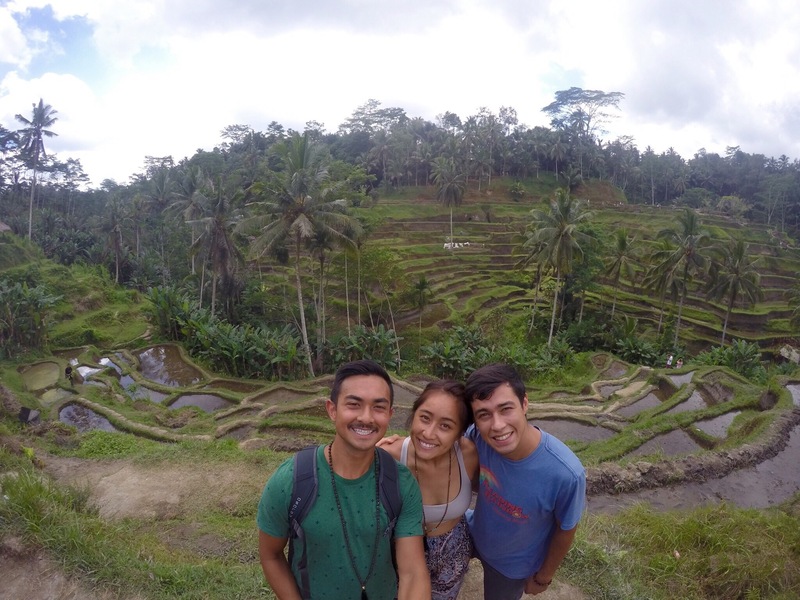 To my surprise, walking through the rice terrace was fairly easy, and we made it to the top in about 20-minutes. We had to pay two donation fees going to the top (they request at least 10,000 IDR). 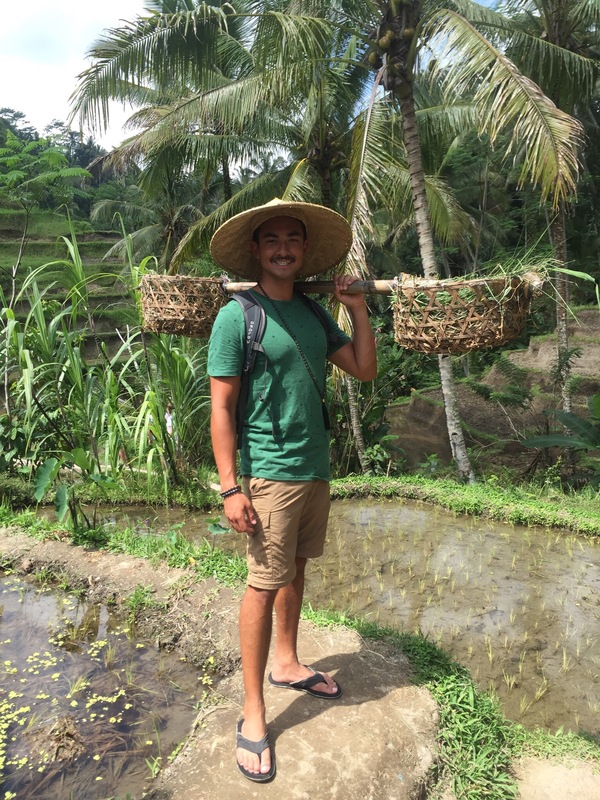 On our way, Alvin and Josh took pictures wearing farmers hats while holding woven baskets, which also cost a fee but made for some really cute photos. 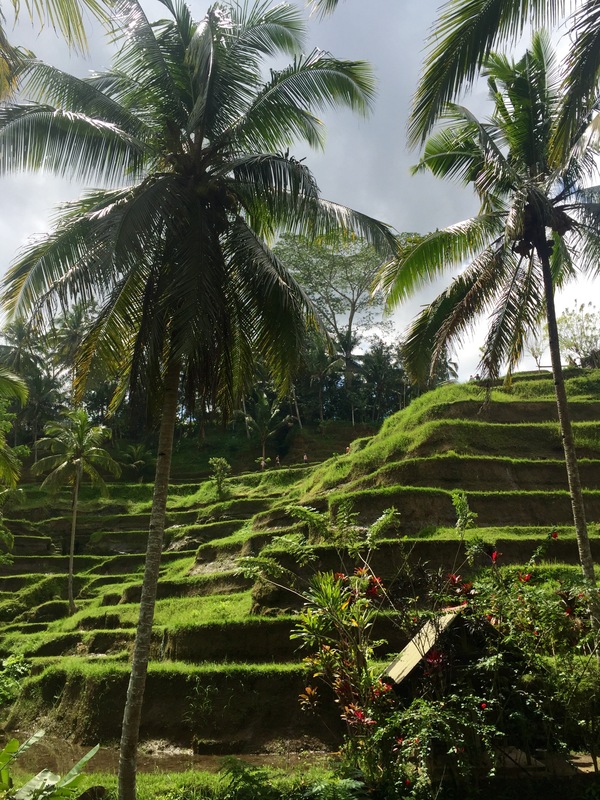 By the time we made it to the top, Alvin left to catch a Tibetan Bowl Meditation class back in Ubud while Josh stayed with me to travel through the terraces more. 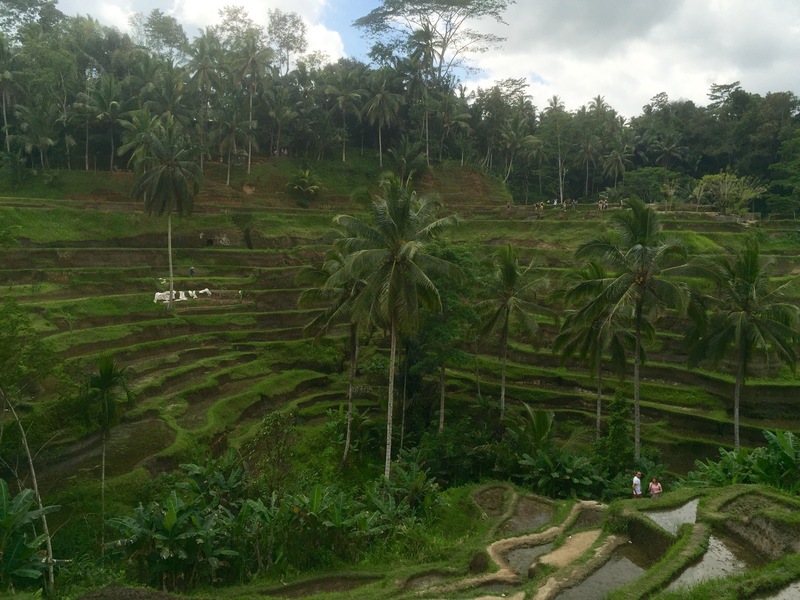 It turns out that there was an entire backside to the rice terrace that we didn’t know about. 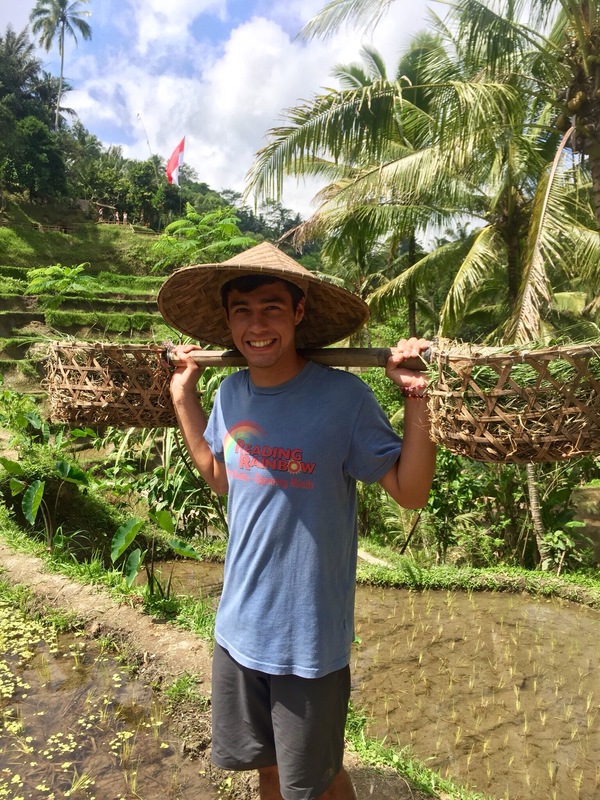 Josh and I met more local rice field workers who all smiled at us and asking where we were from. One of them asked if Josh and I were husband and wife. He said I was beautiful, and then pointed us to the direction of his wife who was selling fresh coconuts. Josh and I rarely pass up a good coconut. 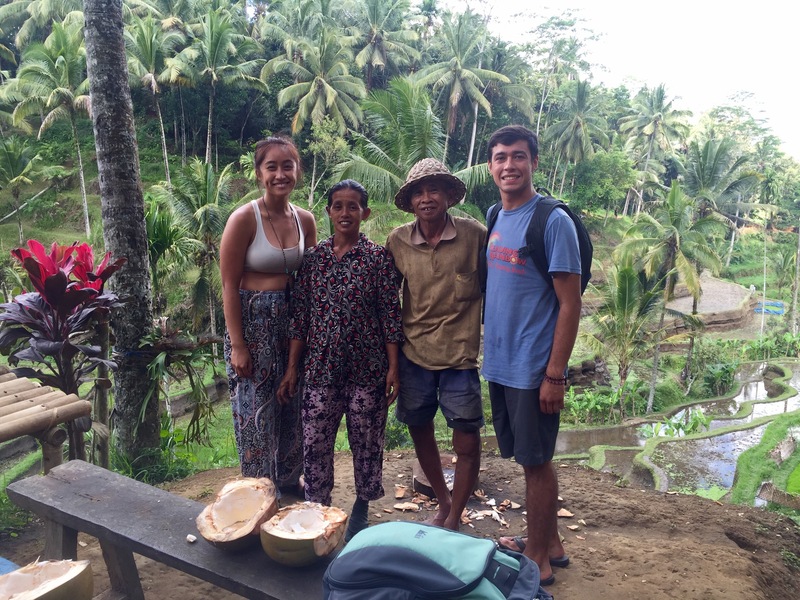 We bought two for 50,000 IDR and gazed upon the rice terraces as we drank what were the most delicious and huge coconuts that we’ve had on our trip so far. 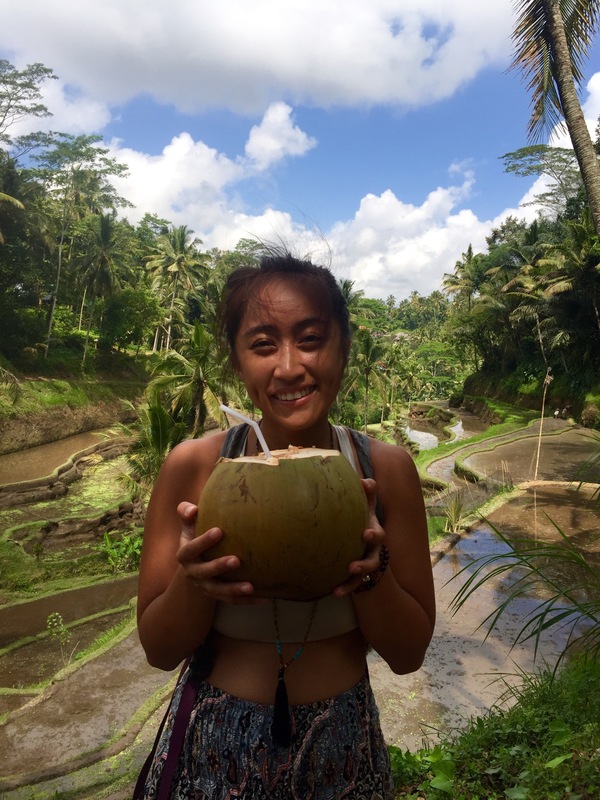 The field worker’s wife played on her Balinese coconut xylophones as we drank and ate from the yummy coconuts. There was something so warm and comforting about her and her husband that made me want to stay there for a while. 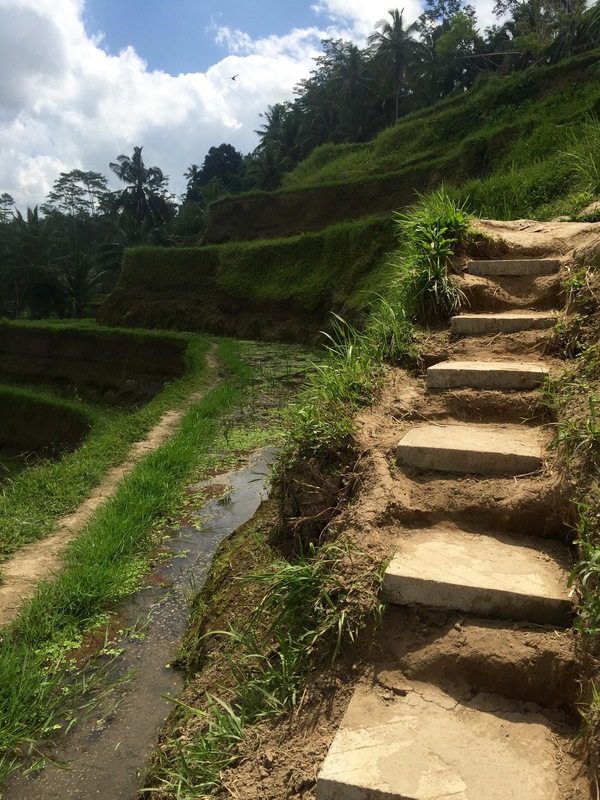 We parted ways and headed back to the entrance of the rice terraces. Both Josh and I suddenly started to feel a little under the weather, and going uphill in the heat started to wear us down. We went back to our hotel, which is when I realized that I had officially come down with the case of some Bali belly (or traveller’s diarrhea). My stomach became very sensitive and I was very dehydrated. Our day ended with another class at Yoga Barn. Listening to our bodies’ needs, we took a yin class, that stretched our bodies out in a nice and calm, meditative way. We had dinner, and I ordered soup and a baked potato for my Bali belly. I went to bed after that dreaming about walking through the terraces again.